Hi, it’s Beatrice, and I’m back on the blog today. Karen asked me to choose a few favorite collections and inspire you with layouts that use them. Honestly, all SnickerdoodleDesigns’ Collections are so amazing, it’s impossible to choose just three. Instead I looked for some older collections since my previous blog posts have been focusing on new release designs. For my first feature I chose Rise and Shine Collection. I love this layout by Kabra using the Rise and Shine Collection. I’m always on the lookout for heritage layouts and this one is priceless. I really like the lace brushwork and that she used it on only two edges so as not to obscure the beautiful brushwork that is part of the background paper. Her corner clusters are large and perfectly shadowed. She included the clock which, of course, supports the theme of her layout. 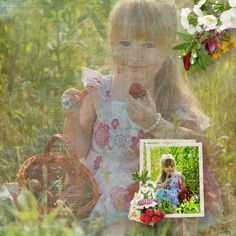 The frame she selected highlights her darling photo perfectly, and the bits of lace and burlap tucked underneath are a sweet touch. Her journaling tells a cute story. Next is another favorite Scenic Route, perfect for your travel photos, current or heritage. I love the way bekfek took an everyday moment and turned it into a stunning layout. The design is so clever. She used Scenic Route Collection and a template by Heart Strings Scrap Art. I like the split design and the way the large photo blends into the top half. The VW Beetle is just darling and reminds me of the “woody station wagons” popular years ago. The horizontal cluster dividing the page is gorgeous as are the three smaller scenic photos. The banner underlines and highlights the journaling perfectly. My final selection is Nature Hike, a great outdoorsy collection. I’ve seen several layouts of these pretty deer by Glori2 and I’m envious of her view. 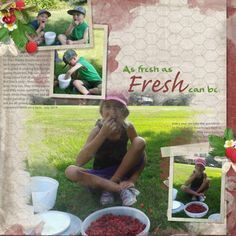 She used Nature Hike with a template by Sherwood Studio. I really like all the framing in both the soft plaid and the wooden frames around the journaling. The delicate clusters are placed in a triangle, a great design touch. The wooden title complements the layout in just the right way and her journaling is interesting though a bit horrifying. I can’t complete my post without showing my new favorite collection, Droplet Template Collection 1. I’m showing you the 12×12 size but there is also an 11.25×8.75 size, Droplet Collection 2. I’ve featured the 12×12 set in a previous blog post and check out this blog post by Karen for a series of great tutorials. I’ve been praising these sets to everyone I know. They are perfect for the experienced user as well as the novice. 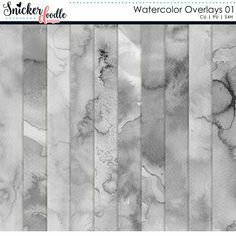 12 x 12and11.75 x 8.25 atSnickerdoodleDesignsThe DigichickDigital Scrapbooking StudioIf you haven’t had a chance to try them yet Karen has very generously created a freebie for you. Just click below to download the template. I promise you will be amazed. Now it’s your opportunity to choose and win a favorite collection from Snickerdoodle Designs. Simply comment at the end of this post with your choice, linked, so we can all take a peek. The winner will be chosen – by random draw – Thursday morning, November 23th and posted both here on the blog and on Facebook. Remember the collections come with both clusters and borders. If you need a last minute Christmas Gift, combining the clusters and borders with the droplet templates, will make things fast and easy. Here are two more tutorials you may enjoy. AND here is another tutorial on using the templates with photobook printing sites! I cannot wait to see your favorites. Good luck and have a great week! That’s like asking me to pick my favorite child. But since you said one, it will have to be scenic route. Thank you for a chance to win. Love all the designs from Snickerdoodle Designs by Karen. If I win I would like the new Droplet Template Kit in the 8 1/2 x 11. I have already purchased the 12×12 and love them. It is hard to choose since I own so many of Karen’s beautiful collections already. So I’ll go with the newest…Droplet Templates Collection 12×12. Thanks so much! Wow! So very generous! Thanks for the chance! If my entry is chosen, I’d like to have the Droplet Templates Collection 01-12 x 12 please!! I have been wanting My Little Chickadee. I have many of your kits but my favorite is probably “Deck the Halls” That big lovely tree on the cover page drew me in and I loved everything in this set. BUT if I had to choose, I’d probably pick “Rocky Mountain” also. Thanks for the chance and have a Happy Thanksgiving.